While we usually focus on the little gizmos that can improve the details of your life here at Gadgetbox, it doesn’t mean we don’t also keep tabs on the big developments in the technology arena. So today, we present to you a couple of the stories that are making serious buzz in the CES arena. And, just to show we haven’t forgotten our roots, we’ll throw in one of our trademark handy gadgets. Just for you. What can Blu do for you? There’s a secret war going on in the world. It’s raged, interminable, for centuries, rearing its ugly head whenever the tides of current events have swirled into torrential eddies of malcontent. I refer, of course, to the eternal battle between red and blue. Yes, the colors. The latest sign of this conflict? The battle between the competing Next-Generation Optical Formats (the NGOFs): HD-DVD (the red) and Blu-ray (the, er, blue). Both camps are present at CES, and you can see the dark looks cast between them as their partisans pass each other in the hallways, sneering under their breath about capacity or resolution. It seemed for a while as though we would be forever stuck in the stalemate between these two, like some high-definition version of Scylla and Charybdis. Then, just last week, a major blow was struck: Warner Bros., which had previously been the only major studio to sell versions of its movies in both formats, announced that it would go Blu-ray only. Now rumors are sneaking their stealthy way through the night that Paramount will switch to Blu-ray as well, which would leave Universal the only major player left in HD-DVD’s camp. That sound you hear, the high-pitched keening? I'll give you a hint: it's not the sound of my self-control and resolve collpasing in the wake of far, far too many press releases. I visited both HD-DVD and Blu-ray booths on the CES show floor, and while both were still heavily promoting their wares, the mood was clearly lighter at the Blu-ray booth, where I heard one rep declaring that the format war was basically over. While the HD-DVD camp insists that they’re far from dead, it appears that blue may have won…this time. Well, until the day when we can download all our movies over the Internet without having to worry about pesky discs and format compatibility. Which, for all we know, could be next week. At last year’s CES, it seemed that no matter what corner you turned on the show floor, you inevitably came face-to-face with some larger-than-life high-definition display. The winner last year in the size competition was lead by Sharp, which was showing off a 108” LCD TV. This year that record was blown into jonesereens (approximately one-billionth the size of smithereens, if you're wondering) by Panasonic’s latest foray: a 150” plasma TV. One-hundred and fifty inches. That’s a diagonal measurement of twelve and a half feet. Or, to put it truly in perspective, you could put two of me end-to-end and still have a couple of inches left over for, I don't know, a tiny digital camera or something. The screen's so large that you could probably put a picture of a small car on it and have it be actual size. It boasts a resolution of 4,096 x 2,160—for those keeping score at home, that’s four times more lines than 1080p, which means that whichever NGOF does win, we still lose&mdash;just like when aliens fight Predators. There’s no pricetag on the 150”, which is just as well since it may be physically impossible to own both this TV and your own soul. Crikey. I swear, my paltry 27” Sony Trinitron just keeps getting smaller. Anyway, I’m considering sneaking into the show floor tonight after it closes (through an air duct, natch) and trying to get some Halo 3 going. Any takers? Sometimes good things come in small packages too. Take for example, the Data Locker Secure Drives. More and more, users are turning to external drives to store their files, especially in this era of mobile computing. But the more drives you have, the more you have to concern yourself with the security of your data. That’s where something like the Data Locker comes in. At first blush, it looks much like any other external drive: USB 2.0 interface, shiny rectangular casing, LCD display—whaaaa? That's right, but not only is it an LCD display, it’s a touch-sensitive LCD display. When you plug the drive into the computer, you’ll see a numeric keypad appear on the display and unless you enter the correct PIN code the drive will refuse to mount—and will subsequently burst into flames. Okay, well, not really. But your data will be locked down tighter than a childproof medicine cap. And, in fact, even if a particularly determined data thief pilfers your drive and pries it open in the hopes of retrieving its juicy secrets, the data will still be unreadable (the reps told us the data is not encrypted, so we're not precisely sure how that works). The drives are available in your choice of capacities: 80GB for $160, 120GB for $200, and $250 for $300. Should you be the type who likes to roll your own drive, you can just buy the enclosure for $100 and pop in an SATA drive of your choice. There are downsides, however: though the drive is Mac-compatible without any additional drivers, it only supports FAT32 or NTFS—so, for Macs, read FAT32. That means that you can’t use it to store files if you want to keep their metadata intact. 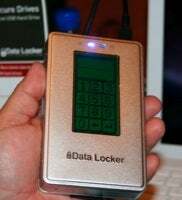 Still, if your concerned for your data security trumps all other worries, the Data Locker might be what you're looking for. And heck, who doesn’t love LCD touchscreens, right? Well, that’s day two in the bag. Phew. Don’t forget to come back tomorrow for our third and final installment from the CES show floor, or, as I like to call it, the arena of technological marauding and mayhem. Remember: if you're not broken down and exhausted, you're just not invested enough.